How Do You Like to Travel Around Baltimore? There are many ways to travel around the Greater Baltimore area, and with infrastructure improvements in the works, it will soon be even easier to travel to and within the city. Whether you are stopping by for a few days or live here permanently, there are plenty of ways to get around. We have had respondents and clients alike use a plethora of methods to get about the city and come to our market research facility. So what are some of your options for traveling in the Baltimore metro area? BWI Thurgood Marshall Airport is the main hub for air travel in the area. Located just south of the city, downtown Baltimore is just a ten minute cab ride away and our facility is only six minutes. The airport is also connected to Baltimore via Light Rail, and to the DC Metro via the B30 Metro bus. Baltimore’s Light Rail system is a north-south passenger line that extends as far north as Hunt Valley and as far south as Glen Burnie. Trains run 7-days a week. The Light Rail’s east-west equivalent, the Baltimore Metro Subway runs from Owings Mills to Johns Hopkins hospital 7-days a week. The MARC train is a commuter train that connects Baltimore to DC (with stops in between) and runs on both weekdays and weekends. Travelers from Baltimore can board at Penn Station in midtown or at Camden Yards. AMTRAK services Baltimore’s Penn Station, connecting the city via high speed Acela rail to other cities on the heavily traveled Northeast Corridor, as well as points west and south. The Red Line is a planned above and below ground rail line that would connect the western parts of the city to downtown, Fell’s Point, and Johns Hopkins Bayview, among other stops. It is tentatively scheduled for operation in 2022. The 695 Beltway circles the city to provide easy access to points outside city limits. The 95 corridor runs through the city, connecting Baltimore with DC and Philadelphia. I-83 gives north Baltimore residents a straight-shot downtown. The Baltimore-Washington Parkway also connects the city to DC. Taxis, Uber and Lyft are all popular means of transportation in the city. MTA bus lines crisscross the city and also provide access to areas around the city limits. The new Charm City Circulator has quickly gained popularity as a free and easy way to get to areas around the Inner Harbor and downtown areas. Baltimore’s Water Taxi connects a number of locations along the city’s waterfront, making it easy for pedestrian travelers to get from the Inner Harbor to Federal Hill, Fells Point, Locust Point, and Canton. 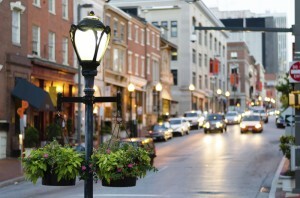 It may surprise you to learn that Baltimore is also a very walkable city. In a walkscore.com survey of 141 cities, Baltimore ranked 16th in terms of walkability and 14th in terms of transit overall. This entry was posted on Wednesday, December 3rd, 2014 at 6:54 pm. Both comments and pings are currently closed.